The Environmental Defense Center protects and enhances the environment of California's south central coast through education, advocacy and legal action. Equal Start is a Beth Am social justice initiative to provide high-quality early learning opportunities for every child, from birth to age five. 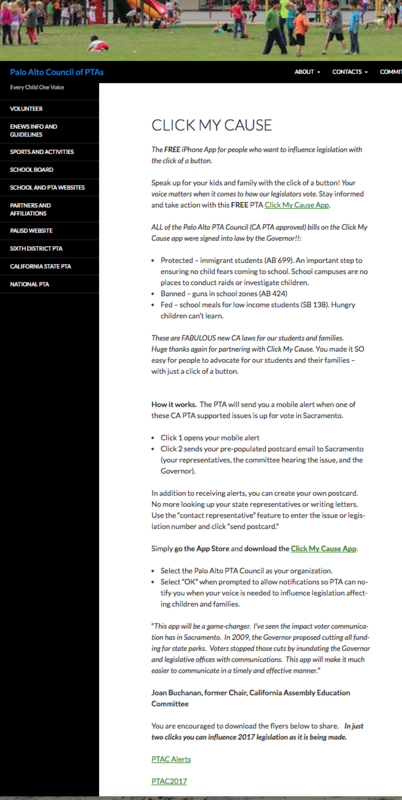 The Council advocates for California state PTA approved legislation. We represent all 35 school PTAs and PTSAs of the San Ramon Valley Unified School District. The Council represents all 17 PTAs of the school district. The Council supports students and families, and advocates to improve the education and welfare of all youth. Our Council's mission is to make every child’s potential a reality by being a powerful voice for all children through collaboration, commitment, respect and inclusivity. Advancing the conversation of respect & responsibility. Empowering individuals to stand up to sexual assault. Beth Am Women works to build a warm, welcoming and inclusive community. We invite you to join our social justice advocacy for children. Ensuring every child is on a path to thrive in kindergarten and lifeAdd backend Info text unless make it blank. The Silicon Valley Children’s Advocacy Network (SVCAN) is a coalition of early childhood advocates from San Mateo and Santa Clara Counties. We speak with one Silicon Valley voice in Sacramento to identify common state policies and budgets that affect Silicon Valley children. The Tuolumne River Trust is the voice for the river. We promote stewardship of the Tuolumne through education, collaboration, restoration projects, advocacy and grassroots organizing. EveryChild California advocates for publicly funded early care and education programs. We support the development of the child's social, emotional and intellectual well being, all the while in a safe and high quality learning environment.